Sunset Symphony in the Sunflowers – Sugar vs the Reef ? Sunset Symphony in the Sunflowers is finally happening! We’ve been collaborating with farmer Simon Mattsson on this idea for ages now, ever since he first started experimenting with planting sunflowers in with his sugar cane a few years ago. This is a key event in the ongoing evolution of our Sugar vs the Reef project. We’re going to carve out an amphitheatre from the sugarcane and sunflowers crop, and host a gala afternoon in this piece of agricultural architecture! We’re blessed to have former ABC radio maven and local knowledge expert Kim Kleidon on board as our production manager for the event. The Sakwolo Dancers performing traditional South Sea Island dances. and we’ll show a documentary about Simon Mattsson’s innovations in local regenerative agriculture. There will also be a special cocktail, “The Mariana”, which features sugarcane juice, and canapes from the Family Table. WHEN: Sunday 30 July 2017, 3:30pm-6:30pm. HOW: Buses will take all punters to the event. COST: $40 adults, $10 kids over 12. LIMITED TICKETS, book now! A PDF of the poster is linked here. 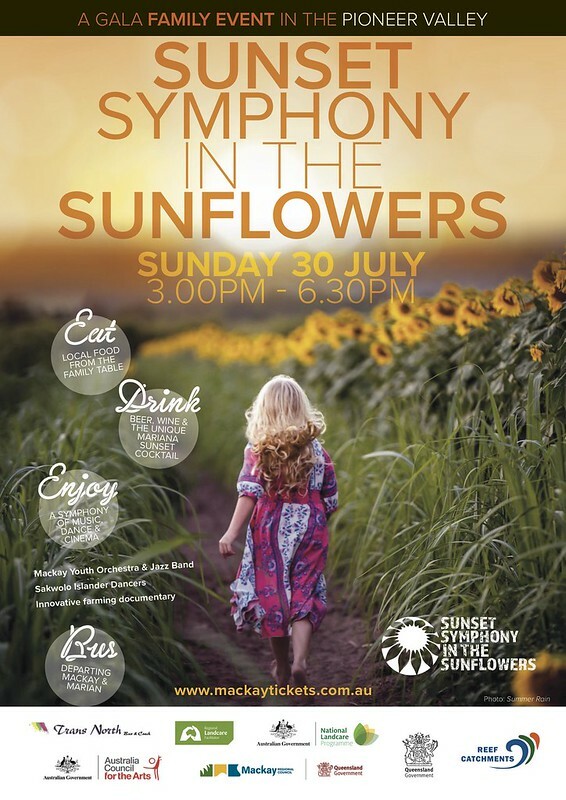 Support for Sunset Symphony in the Sunflowers has come from Australia Council for the Arts, Reef Catchments, Mackay Council, the Queensland Regional Arts Development Fund, Landcare, Transnorth Bus and Coach, and the Australian Research Council.